At All Safe Technologies, we understand how much goes into making a restaurant or bar a successful business and an attractive option for customers. The food, the service, the atmosphere, the list goes on. You want your restaurant to run smoothly and your customers to return again and again. At All Safe Technologies, we want this for you too! We aim to provide you with tried and tested products that will enhance your restaurant or bar, and keep your customers coming back for seconds. We offer multiple systems to cater to your front of house needs. Our temperature control can be adjusted to specific areas so that you can furnish your restaurant with ‘micro-climates’, keeping the smoking section nice and cool, and other areas more moderate. Our lighting control can also be adjusted for various areas, meaning that some areas can look crisp and clean while others can be warm and inviting. Our audio video systems can turn any evening into an event! All Safe Technologies can furnish your restaurant or bar with as many screens as you require so that if there is a big game on, no one needs to miss out! High definition and high resolution, our screens come in multiple sizes so that you can find the perfect fit for your restaurant or bar. Our sound systems are perfect for both high volume, crisp sound for sporting events, and also for soft, relaxing background music while you eat. All of our systems are installed by our highly trained team of technicians that understand the environment in which they are working, and know best how to navigate it. 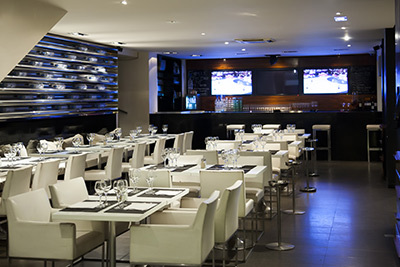 Give your restaurant or bar the boost it needs with a little help from All Safe Technologies.